I hadn’t stepped foot in the United States of American for over five years since retiring to the Philippines. But this past late September, I was back in the USA. It was the return of the American expat. My only reason for my visit was to see my 82-year-old Father who had retired to Las Vegas several years ago. 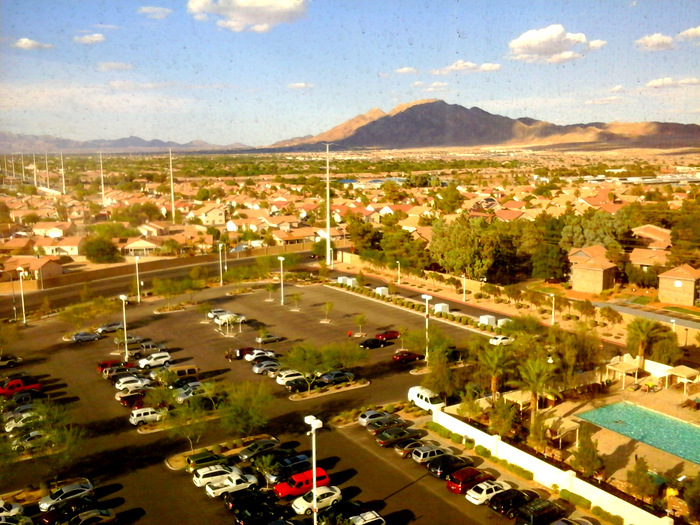 The view from my hotel window in Las Vegas. After a ten hour flight on Korean Air, an airline staffed with professional flight attendants that served some of the best airline food I have ever tasted, I arrived in Sin City. After I breezed through Immigration (I was the only American citizen on my flight), and greeted the friendly Immigration officer with a hearty “God Bless America,” I finally located my Dad and his girlfriend, Jane, who had driven to the airport to pick me up. My Dad knew what time my flight would arrive (it touched down 30 minutes ahead of schedule) but we had not made any plans as to where we would meet at the expansive McCarran Airport. I walked outside into the late afternoon warm desert air. The temperature was around 90 degrees. The humidity was low, at around 20 percent, but I was still uncomfortable. I stepped back in the air conditioned comfort of the facility and waited in the International Arrivals. Still no sign of my Dad. I walked outside and met a worker, a Filipino, and asked him where visitors from Henderson, where my Dad lives, would park. He pointed to the parking complex nearby and advised me to go the second level. I told the man I had just arrived from the Philippines and after a minute or two of small talk, I headed to the parking level. I saw my Dad and his friend Jane ahead of me and I yelled, attracting some attention, included my Dad’s. After a hug, we headed back to Jane’s vehicle for the ride to the Eastside Cannery Casino and Hotel where my Dad and Jane had booked me for my two week stay. It was a great room on the 9th floor with a big TV, HOT shower and HOT water and a spectacular view of the nearby mountains. Now you might wonder why, after over five years of not seeing my Dad, I would opt to stay in a hotel casino. Space was limited at Jane and Dad’s home, plus they had two INSIDE dogs. My Dad often chided my Aunt Mary who had two toy terriers named “Pixie” and “Dixie” who lived inside their home. When my Slovak aunt, who demanded we only address her as “Mary”, would turn on her polka music program from St. Louis every Saturday afternoon while chain-smoking her Camels, you could barely hear the accordions above the constant yammering of her excitable canines. 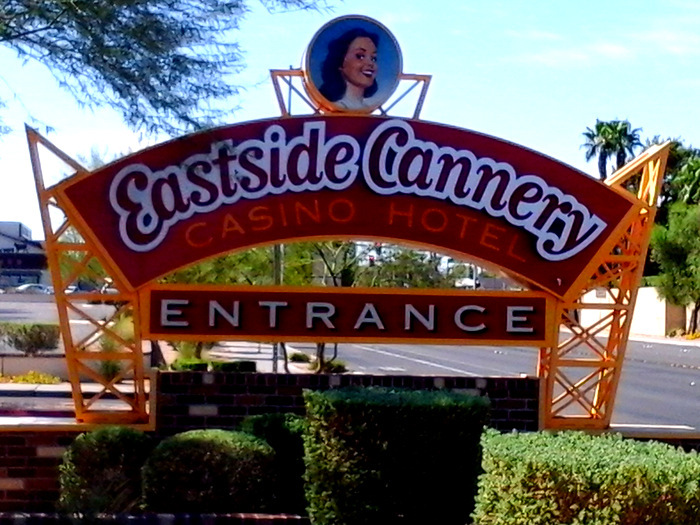 My Dad informed me that his dog “Sammy” and Jane’s new Yorkie, “Muffin” also had a propensity for barking at all hours so I decided to take them up on their offer and stay at the Eastside Cannery Casino and Hotel where my Dad, along with Jane, spent most of their free time playing the slots and bingo. It was good to see my Dad again and after a few hours sleep I met him the next morning where he treated me to a rare treat, an “All-American Breakfast,” two eggs, bacon and toast. The special only costs $3.99 but my Dad and Jane collect tickets for a “free” breakfast when they bingo. Though I have a mild fatty liver, I’m supposed to stay away from fatty foods but there was no way I was going to pass up a meal that included bacon, something I’ve only eaten about two or three times since retiring to the Philippines. My Dad also treated me to a daily free buffet where I enjoyed delicious turkey, another rare treat, along with a selection of food choices at one place that I haven’t seen in years. I had lost over 20 pounds before going on this trip and had been down to around 185. But since I was on vacation I decided to live a little and downed a couple of plates of food at each buffet sitting a along with cheesecake or pie. When I returned home I weighed myself. My net weight gain? Absolutely zero. I weighed 185 and continue to keep maintain that. Don’t ask me how I managed that. Aside from a one hour session on a stepping machine at the casino gym, I didn’t exercise at all. I’ve returned to my daily walks since my return to the Philippines but after devouring the All-American breakfast every day and a daily buffet, I can’t figure out why I didn’t gain any weight. Perhaps the fact that I did not snack in the evening and usually had the buffet at lunch time, which ended up being my final meal of the day, had something to do with that. 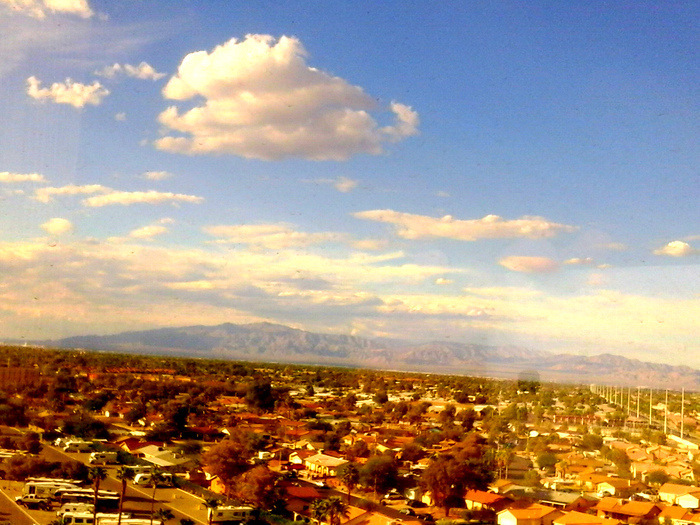 Another view from my room. The temperature cooled down to high’s around 80 around with lows of 62. Pleasant weather. The fact that I always eat my last meal of the day in the Philippines no later than 4 pm, has probably helped me keep my weight off. I enjoyed talking to about a dozen or so Filipino workers at the casino and made some new friends, such as Percy, the slot machine mechanic. Two of the workers even came from Iloilo, where my asawa and I frequently shop. A few of the Filipinos expressed a desire to retire to the Philippines when they grew older though all of them seemed to be content in their new home in America. Two trips to the local Walmart to pick up some supplies to bring back home ibuprofen, folic acid, original Old Spice deodorant, along with a few other items, made me long for the local SM City Department Store in Iloilo where the pretty pinays greet me with a smile and everyone is eager to help me. I walked through Walmart and the hotel casino without attracting any attention. I was no longer the celebrity I was back in the Philippines. Do I miss America? Not one bit. Do I miss my Dad and my American friends? Of course. But I’m content living a less stressful simple life in the Philippines and live it a lot cheaper. God Bless America? You bet. But God Bless my new home, the Philippines, also. Long did it take to get rid of the jet lag. I would eat more salads, Papa Duck, but we can only get iceberg lettuce over in Iloilo, and that’s my favorite ingredient for a salad. Way too hot over in Guimaras, however, to grow lettuce but Melinda is attempting to grow some Big Boy tomatoes here again. Have to see how that goes. Good to know you made it home! I sent you an email couple of weeks ago but maybe it got lost. How did you buy your Korean Air tickets. When I go online to buy it says you can not buy them when in the Philippines? Sorry, Ron, I didn’t get the email. But I purchased my tickets at a travel agency inside our SM Delgado Mall in Iloilo, ELS Travel & Tours. I purchased my round trip economy class ticket this past February for about 1,300 US Dollars. I see that same message when I go online for Korean Air, also. As far as I can tell, Korean Air, which I highly recommend, has one of the shortest times to the States, at least to the West Coast. Only 10 hours from Incheon, Seoul to Vegas. The return trip was longer at 13 hours. Great service, good food and ahead of schedule. The shortest time from East coast to Cebu is why I have always flown KAL also, but might try another airline this next trip, mainly just to see some of UAE, or at least an airport there, depends on the amount of layover time. They always leave the middle seats unoccupied also, which is a big help on such a long flight. (13 hours from Seoul to Dulles) Was wandering on your flight if they did that also. KAL left the middle seats unoccupied from S.Korea to Vegas, Bill S.. 10 hours. However, on the flight back, the middle seats were occupied (one of them by me) and the flight was 13 hours. I would use Korean Air again but when I return for my next visit will always check out the cheapest fare first. Thanks for the info. Yes we have flown 3 r/t with them. Great airline. You’re welcome, Ron. 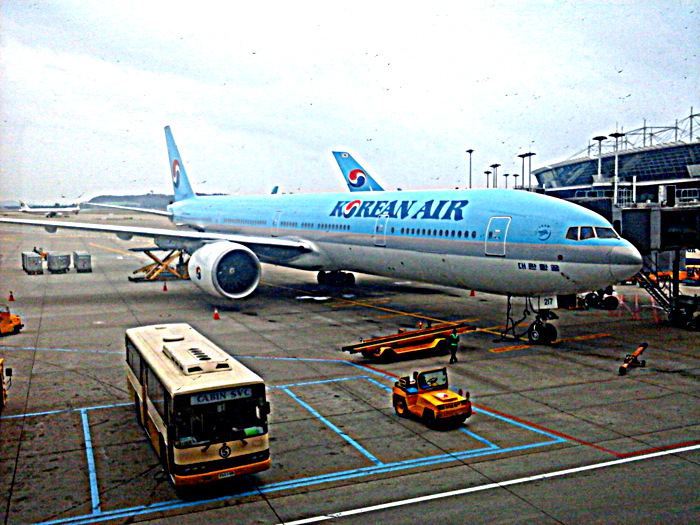 I have to make a return trip early next year and I definitely will go with Korean Air again. It seems that the Philippines have captured your heart. Sometimes they say “There’s no place like home.” There’s no place like America. But there’s no place like the Philippines. Philippines is a melting pot of culture. We have been under Spanish occupation,Japanese occupation, American occupation and Chinese occupation. Thats the main reason why Filipinos can adopt to any kind of life whether,americans,chinese,japanese or spanish. And they say you can name any country and I bet you there is no country that there is no Filipino. In reality of course there are countries that no Filipinos at all. We appreciate expat like you who shared with his fellow americans and other foreigners the life of Filipinos here. Filipinos are loving and hospitable people. We welcome everyone in this country as our guest and later on as member of a family. In the Philippines we always value paternalism. I have a permanent resident visa, Mr. Edwin, to stay in the Philippines without ever having to leave. I honestly do not miss the United States and my wife and I are busy with the new house we are having built on our island province. The Filipinos are friendly, warm people and I’m very happy to call the Philippines my retirement home.